This is a question that has plagued me my entire life. In my family, I was rather an outsider. At school (and I went to 9 schools over the course of my K-12 days) I was not popular or athletic or anything really. In the military, first in the Navy I was a woman in a predominately male occupation (avionics,) then again with the Army in advanced tech/electronics. Later in my Army career, I was older than everyone I worked with, usually by about 20 years. Even know, I feel like I do not really fit in with a lot of the people around me, but they kinda tolerate me because I can be fun sometimes. So this week’s Diva Challenge (#326) with guest blogger Elisa Murphy, CZT, prompted us to use the ultimate “fit in” tangle – N’zepple. Now, unlike last week with Peanuckle, this is one tangle I use a lot. And since I was playing around with some black paper and bleach for another project, I challenged myself to use this as my medium. Different papers react to bleach differently. They have different underlying colors. It was very interesting, and I started to see what colors I could coax out of them. The N’zepple tile is a 6″x6″ cut of some scrapbook paper. The other 2 are a black Apprentice tile and a regular black Zentangle tile. Here is the finished black tile. I did a little shading with some General’s Chalk Pastel in the closest color I could find, but the light spots were just the concentration of the bleach in those spots. I may have gotten a little carried away, as I continued this into my Mandala study on Monday night. And I thought…hmmm…what about other colors of paper? I still have some more work to do on this one, I am going to add some color with colored pencils. And I wasn’t the only one that had fun trying this, eh Karen? And that is all the fun I can stand for today. Don’t forget to check out the store and upcoming classes. AND…if you were on the list, the first newsletter went out today. If you aren’t on the list, hop on over via the Home button up there and sign up! I feel like I fit in a little, even if it is on the fringe! Ok…so the original title of this post in my head from last weekend was “Big Scary Sewing Machine” (more about that in another post)…but then the Diva Challenge (#325) came out. Add tho this a trip where I ended up having to face a fear of heights whilst driving, and out came this topic. First up…fear of heights. I have been working over the past several years to desensitize myself to a fear of heights that mostly manifests during freeway driving. You know…those huge stacked freeway interchanges we have in the United States? Well, I drive a fairly large SUV (Toyota FJ Cruiser) and since I am 5’4″, I cannot exactly see over the hood, and it sits up pretty high. So, I have some little anxiety/panic attacks about those interchanges, and will usually add a few minutes onto my routes to avoid them. Thank goodness for Google Maps, as I can see in the satellite views which ones I need to detour. But, there are places where that just is not possible. Like traveling across bridges. Like the Golden Gate Bridge. One of the most beautiful places I know. And one of my happy places. I have not driven in the Bay Area in about 30 years. Mike does all the driving when we are up there, But today, I had to get myself to the airport and return the rental car so he could drive the Uhaul down. And you know what happened? Nothing. Not even a twinge of panic. I was so emboldened by this that I took the Express Lanes all the way home from LAX and crossed over the new “big scary” at the State Route 91 – Interstate 15 connector. (The caveat here is that I was driving his car, a lot lower to the ground.) But I did it. No sweaty palms, nothing. So, you ask, CharKat, what has this to do with the Diva Challenge this week? Jessica Davies, CZT is filling in for Laura again this week, and proposed the tangle Peanuckle. At TangleU 2016, this tangle was presented by Molly Hollibaugh herself, to a collective groan from the audience. It strikes unease in the hearts of many, even CZTs, as it is a particularly high focus tangle. I can execute this tangle with a degree of technical proficiency, but I have yet to make friends with it enough to make it my own. It is not one I ever do on purpose, and I have yet to teach it. But, I thought I would give it another shot here. I took a 6″ Stonehenge piece with me that I had been playing with Tombow markers and water on, so I used that. I am not unhappy with the results, but I think it just fades into the background a bit. I may try it again more front and center, or just continue to hold it at arms length. Maybe I need to desensitize myself to that, too. I am also going to be adding a FREE Bullet Journaling Support Group, but in August it may take place during Open Studio time on the 13th. And check out Open Studio – EVERY SUNDAY – in August. It is cool inside, and you can bring anything you want to work on. I have been working on a quilt. I have a few things to finish tonight, being out of town for a few days really puts you in a tight spot playing catch up. Sometimes it is a puzzle seeing where to fit things in! Make Stuff…You Will Feel Better! Forgive me tanglers, for I have sinned. It has been 3 weeks since my last blog post. While I could offer a plethora of excuses (I have been pretty busy) this lapse has been brought to you by another bought of my self-doubt and a feeling of being overwhelmed. I started to dive into the cause of this recently, so I can better understand it. I know there have been many books written on the subject, but from what I can tell, in me at least, is that I have too many projects. Too many kits. Too many things I started and then did not finish. But why? I am going to write about this more in-depth in the coming weeks, as I stretch my legs into new role. I have recently revamped my web site, and updated the online store (hit that Home button at the top when you are done here to see the fruits of my labor, and sign up for my newsletter.) I am working at being more productive, and I am going to take you all on the journey with me to share with you what I find. I did not do the Diva Challenge #321. I could make a lot of excuses for that, but I just don’t like drawing with my non-dominant hand. I finished the shop model for the Tick-Tock Tangle Clock class from last Saturday instead. And…if you would love to do this, a kit is available (in limited quantities!) Click on over to the store. I took a book making class with the awesome Deborah Pace, CZT. We made hardcover books (a first for me) and I think I see a lot more of these in my future. I even set it up in my bag in bag so I could carry it around to work in (although it is still blank inside…) The cover is a piece of wallpaper from a sample book we have a the shop. Then I jetted off to Austin/San Antonio for a few days to hang with the small human (we went to Schlitterbahn) and to see Iron Maiden. I did get Diva #322 done. I love AquaFleur (I think you may see this again later in the post.) I did this in my green Latka journal. The paper is REALLY rough and bumpy. I started (or rather continued) an Opus tile for the August 19th class Summertime Blues – an Opus Undertaking. This is going to be grand fun, with a whole class dedicated to blue pens, tangling in tangles, and using shapes for strings. You will not want to miss this one! I will have it up in the shop to reserve your spot sometime this week. I also folded up a cute tile frame set for my Celtic Knot Bijou tiles. This was fun. Try-piggy and Stone Bijou approve. I hung out at the shop on the 4th (nothing better to do, really, and I hate crowds…and it is pretty hot here right now.) Whilst demoing techniques to put raised gold on tiles, I popped out this little number for the Diva Challenge #323 – Home. 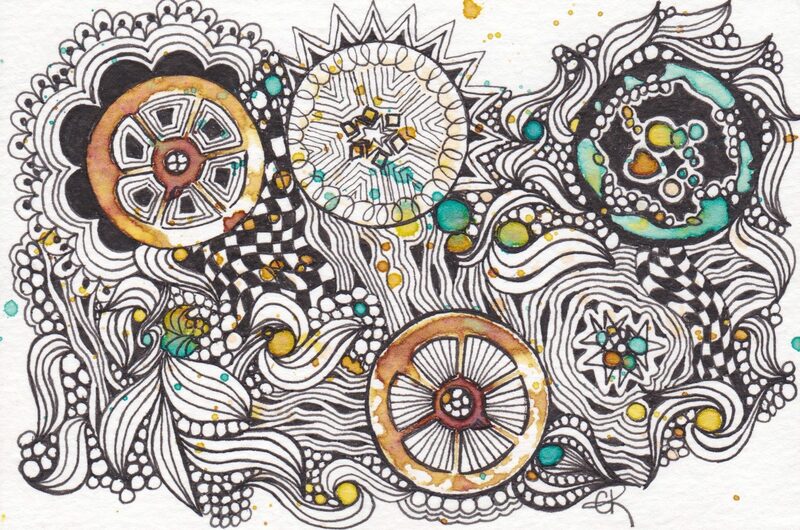 Mixing pointed pen with regular Zentangle is pretty fun! I have been using the new Pigma Micron PN (Plastic Nib) quite a bit lately, and I really like them. This is on an Apprentice tile, so it worked well for the pointed pen as well, but the little bit larger nib of the PN suits my tangle style. I have them available in singles (Black and several colors) and sets (6 and 8 pen multi colored) in the shop. And the red and gold? Those are FineTec Pearlescent watercolors, applied to a pointed pen. Next best thing since sliced bread. I have those in the shop as well. The new palettes with an updated gold arrangement, and these awesome 12 color sets, and 6 color iridescent sets. I started this week spending my Open Studio time on Sunday sewing. Would love to have more people join me! Sew, tangle, journal, whatever you like to do. Come hang out. AND…not last…and certainly not least. This week’s Diva Challenge (#324) Hearts – with guest blogger Jessica Davies, CZT, from Maryland. The minute I saw this post, I knew it was time to finish that heart-shaped box I started at Tangle Island in 2015. It is VERY challenging to draw on a bumpy, curved, irregular surface, so I chickened out after I started the border around the lid and did not finish it. Until today. And I think I may tangle the bottom part of the box later. The San Diego (and SoCal) Zentangle Friendship Group met at the shop today, too, and we played with the FineTec, had a bit of show and share, and visited. We have such a great time. I really enjoy the camaraderie of my fellow CZTs (we occasionally have some of our students in the group as well, but not today.) And dear Denise brought me this cute little piggy note pad! A much better result to what started out as a rather awful Monday! And did I mention that my African violet finally bloomed? It has only been 6 years! I have a couple journal pages to get caught up on, so I better get to it. Make stuff…it certainly made me feel better, and I know it will make you feel better, too!